The traditional ‘cookie-cutter’ home is almost non-existent these days. More and more home designers are using high-tech architectural software enabling them to create one-of-a-kind home designs for their clients. Each design is unique and satisfies every need and desire of the client. Have you ever gone to a Parade of Homes in your area? They can really inspire you to try new ideas and help you to visualize your dream home design. When we were getting ideas for our new home, we would drive through neighborhoods and take pictures of the homes we liked. Then we would document what we liked about that particular house. For example: the stonework, paint colors, window placement, unique architecture, decks and patios, even the landscaping. One thing that really gives a home great curb appeal is a beautiful garage door. Your garage door is the largest opening in the home and is usually seen from the street. Matching garage doors to entrance doors really makes a big impact. It’s something to consider when designing your home. At Anderson Garage Doors you can choose from over 50 different window styles and many different glass options. Every garage door we sell comes with multiple window options no matter the size and style of the garage door. With all these options, matching garage doors to entrance doors will be easy. Our Decratrim inserts come in short and long panel designs with a variety of glass options; clear, obscure, frost and dark tint. The glass can also be insulated. Decraglass windows have a baked-on ceramic design similar to stained glass windows. They are very unique and add a fun aesthetic to your home. We also carry mosaic window options for your contemporary home design. When matching garage doors to entrance doors, consider the color as well as the window style. 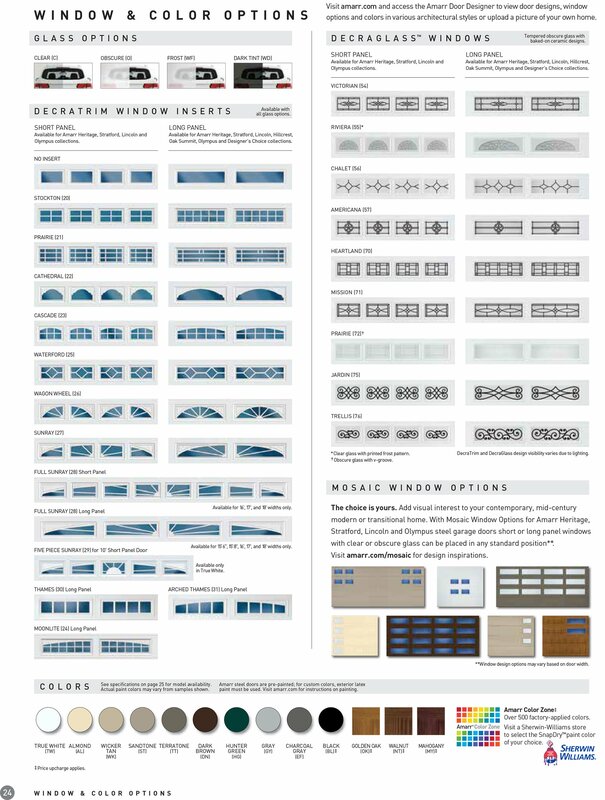 Our Decratrim window inserts come to match the color of your garage door or you can mix it up and choose a contrasting color to match the color of your home, trim or entrance door. The inserts come in 13 standard colors, or you can be bold and choose from over 500 Sherwin William color options. When it comes to color, have you thought about painting your garage door to match your entrance door? It’s a bold statement but looks amazing. If you are having trouble visualizing how a certain window style or color will look on your garage door then go to Amarr.com where you can upload a picture of your home then add on a new garage door with your choice of windows and colors. It’s simple to do and can help you make the best choice for your home. The look of your garage door is definitely something to consider when designing your custom home or upgrading your existing home. Take a minute to check out all your options, including matching garage doors to entrance doors. Need help? Contact Anderson Garage Doors and we’ll help you find that perfect match!